Earners will have the clinical competence to recognize subtle cases of abuse, understand when and how to evaluate for further abuse / other diagnostic mimics. They will know how to effectively communicate their findings to community partners such as law enforcement and child protective services. 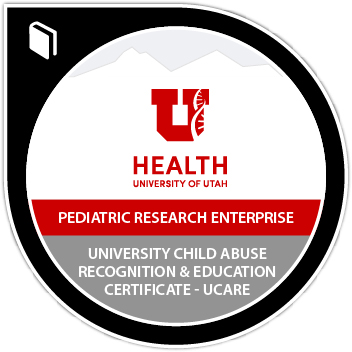 They will have an understanding about community resources that are available to help support families, improve child safety and learn how and when to access sub-specialty child abuse pediatrics support. Complete a 3 day in-person simulation experience. Take a trauma history from a “parent” in a case of suspected child abuse, deliver information to the parent that child protective services needs to be involved, prepare a written medical report, practice photo documentation of injuries, and initiate further testing on the “patient”. Practice testifying in court using lawyers who will take them through voir dire to qualify them as expert witnesses. Engage in direct and cross examination.